Inflatable stand up paddle boards are all about innovation and making it possible for the user to enjoy the best of both worlds; practicality of inflatable products and the durability of the hard ones. Aqua Marina is a global bestseller brand that made it possible for iSUPs to shine in a way where designs, colors and purposes are all taken into minute consideration to build beautiful and durable inflatable boards. Today, one of their most attractive iSUPs is going to be closely reviewed for you to see if this is what you’re looking for. The Aqua Marina Magma is our guy for this review and it’s definitely one to impress. 10'10" x 32" x 6"
The Magma is what we can call a standard sized board; it’s 10.10 feet long and that’s a number that can be fitted for different riders and skill levels. 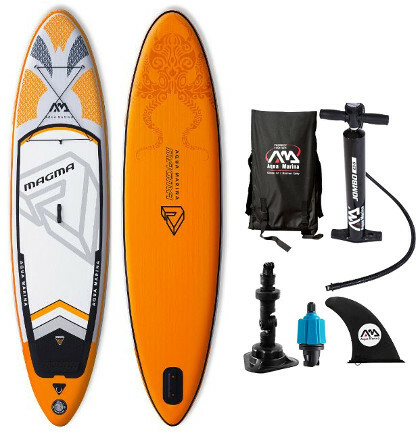 With this length, this board is extremely easy to handle and control whether it was deflated and ready to be packed; or fully inflated on the way to hit the water. Width here is also pretty much the norm; you’ll get a nice 30 inches in width that’ll do more than great for even large riders. That being said, a beginner will enjoy this board very much thanks to its friendly dimensions. This board is 6 inches thick; it’s a measurement known for making any iSUP a really stable one, as it’s rare to find a 10-12 feet board that’s thicker than this. These 6 inches will prevent the board from sinking into water even when it hit its weight limit of 308 lbs. It’s a fact now that inflatable stand up paddle boards have so much to offer in a present life style that appreciates anything that’s compact, light weight and practical. Aqua Marina assure their clients that quality and durability are no way going to be compromised in order to make a practical iSUP. The Magma is made using SuperTough Dual Stringer (STDS) technology with 1000 denier stringer that add immensely to the stiffness and durability of the military grade PVC that’s used to build the outer shell of the board. The inside of the board, however, is made of premium Drop Stitch core that’s known for being extremely tough yet surprisingly light weight. It’s no joke; once the SUP is fully inflated, one would definitely get confused for a second before realizing that the board is actually an inflatable. With its beautiful design, the Magma will turn super stiff to the point where bending it would be almost impossible which is nothing new to all of Aqua Marina’s iSUPs. To begin with, the Magma has a killer graphic design. I mean let’s be honest; how cool and attractive are these colors and patterns? The moment you lay eye on it you can feel the adventurous and wild spirit surrounding it. It’s a really sharp looking iSUP. Next, and which is as cool, the Magma is featured with an action camera mount for anyone who’s into documenting their trips and adventures. It’s an awesome add especially that this board is designed for explorers who want to cruise new waters and enjoy adventures. There is also a tail kick almost at the end of the board’s back. It’ll help you perform a bunch of maneuvers and critical turns to enjoy a stand up paddling experience that’s more raw and fun. 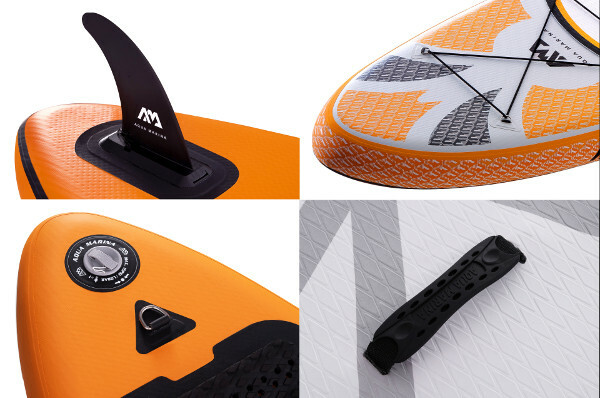 The tail kick pad is connected to the traction pad which is diamond grooved, very soft and extremely functional keeping your feet from slipping off the wet board. This pad technically covers half the board’s back and it is part of its previously mentioned cool design. Another feature is the tie-down system that consists of 4 D-rings on the board’s deck which is the most usual. These D-rings with a bungee cord connecting them are mostly handy when in need to secure your paddle for a break or securing any extra cargo that you might need once in the water. There is a fifth D-ring on the board’s tail for safety leash attachment. Now, when the board is fully inflated, you won’t be needing help to transport it around. The central carry handle makes it possible to carry the board comfortably and single handedly. As for when you’re in the water, the navigation system will keep the board in a straight tracking line which is very important for a smooth and effortless ride. However, there’s only one fin featured and it’s large and removable. This is pretty much everything you’ll find on the Magma and I somehow find it luxurious in a way that’s sharp and wild. You won’t be lacking anything to hit the water with this board. 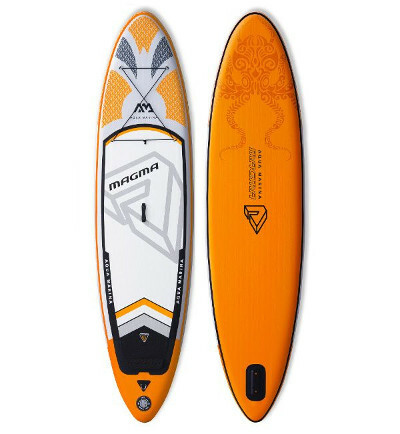 The Aqua Marina Magma is an all-round inflatable paddle board, in other words; it’s designed to be smooth and swift in the water, and it’s also built in a way to take some beating in different water conditions. The Magma can be used in flat water, in rivers, or even white waters if you got the skill level to do that. And even if you don’t, even if you are a beginner; this board is a great size for anyone who just started standup paddling and who wants it to be a whole and awesome experience. The Magma delivers a stable performance and an impressive tracking in different water conditions. With just a little skill and effort, anyone can get on top of it because it’s nothing near wobbly or shaky. Now for users who are more into wildness, badass maneuvers and somewhat speed; the Magma can definitely cover that. Using this board to take on some waves allowed me to actually use the tail kick for a better control over the board, and I tell you what; I wasn’t disappointed at all. However, I can’t say that the Magma is a fast board because simply it’s not meant for high speed or racing.